from our 'Out of the Box' BOM. and they look so fabulous...well done! hiding among some flowers too. A little lace square tea dyed and stitched on. 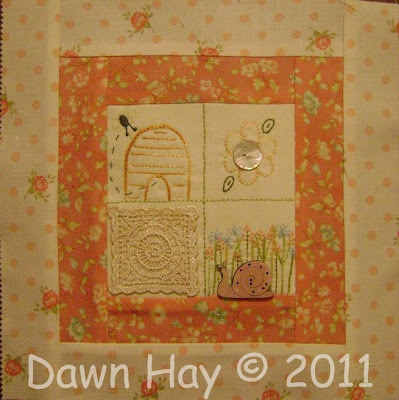 and a lazy daisy trimmed with a button. You can now download my Block Two HERE. 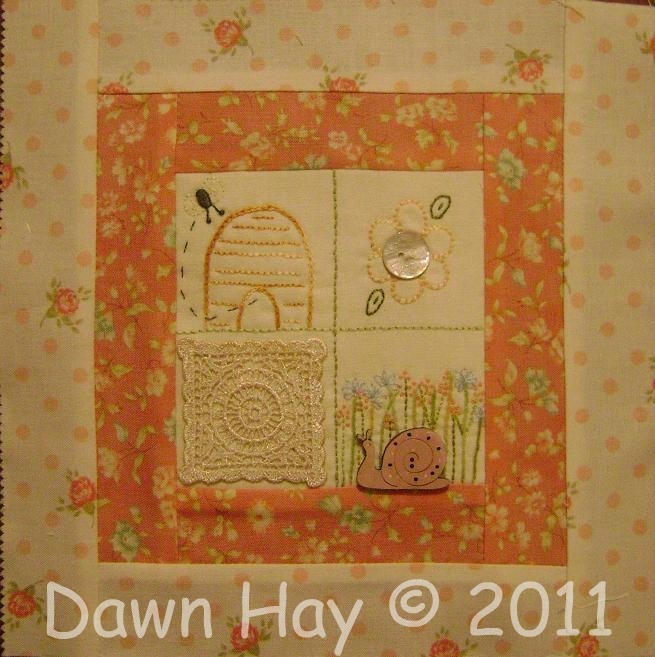 Don't forget to visit Vicki for her block two pattern as well. who are stitching along with us!!! Theodora Cleave Button like I have used in block three. Easy! to Flckr get an extra entry! Now you have until February 28th to stitch and upload. I will draw the winner on the 1st of March. WOW - this is adorable! Thank you so much! I can't wait to stitch!!! I'm just about to start block 1, so will have to get cracking. Checked through my embellishments and will be using mainly buttons (all those lovely ones I've collected over the years) and various ribbons. Am looking forward to it, thanks!! More beautiful stitcheries in this 2nd block! More gorgeousness! I love it Dawn! I hope to start soon - my shoulder is giving me fits, too much handwork and computer. But I love it so much - I want to make it just like you did! Thank you! How cute Dawn. Love the buttons. A-DOR-ABLE!! So cute Dawn, sew darn cute! Thank you for this lovely block, it is realy beautiful. Very sweet. Love all the little embellishments. Thanks a lot for block 2 ; I love it ! Wow, another lovely block! My January is finnished. Was a lot of fun! Yes and our patchwork group dicided to be part of it! And they are all different. Really amazing. I hope I can send you a few pictures next month! It's a very nice block! Thank you! Have just put block 2 up on flickr as well. Phew, I'm getting heaps done and really enjoying them. What a sweet block, Dawn! What a sweet block, Dawn. Thank you for the pattern for block 2. It is so lovely.